The Lemon Yellow Lab originates from rocky areas of Lake Malawi in Africa. It is an “mbuna” or rockfish. It is also called the Lab, Yellow Lab, Electric Yellow Labido, Electric Yellow Labidochromis, Yellow Labidochromis, Lemon Yellow and the Blue Streak Hap. The scientific name “caeruleus” means blue and refers to the fact that the black streak along the top of the dorsal fin turns blue on males during breeding. Most Labidochromis caeruleus are yellow, however some specimens are white or light blue. The dorsal fins are black and there is black coloring in the dorsal and ventral fins. 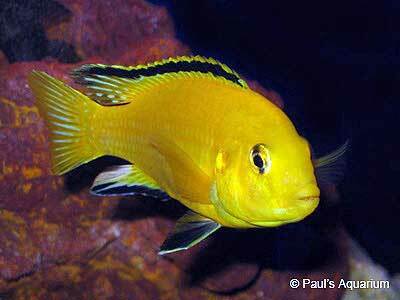 Lemon Yellow Labs are not as aggressive as other African Cichlids, which makes them a good starter cichlid. Males will fight though, so a grouping with more females than males is recommended. Lemon Yellow Labs will sometimes school in tight groups. They will do well in an mbuna tank with lots of rocks, caves and hiding places. The Lemon Yellow Lab is not as aggressive as Auratus or Johannis. They need very clear water, so extra filtration is recommended. 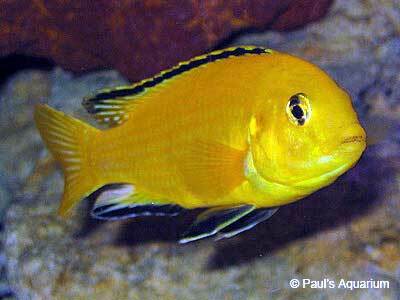 The Lemon Yellow Lab is compatible with Mbuna Cichlids such as the Auratus, Cobalt Blue, Johanni, Pindani, Red Zebra, Tropheops, and Kenyi. The Lemon Yellow Lab can also be kept with synodontis catfish. Lemon Yellow Labs are too aggressive for Haplochromis and Peacock Cichlids. Lemon Yellow Labs build nests by picking up rocks in their mouth and moving them, so underground filters are quickly exposed in an mbuna tank. These fish are fast swimmers and are a challenge to catch in a net. Algae and spirulina flakes are an important staple for mbunas, but less so for the Lemon Yellow Lab. They will also eat flake foods, cichlid pellets, freeze-dried bloodworms and small fish. They should not be fed live worms or live brine shrimp, as these can bloat and kill the fish. The Lemon Yellow Lab is not difficult to breed. Water should be changed and the water level dropped. Males are larger, brighter colored and have more black on the fins. Males exhibit more aggressive behavior when ready to breed. Lemon Yellow Labs do not show egg spots, unlike most mbunas. You should breed one male with several females. Lemon Yellow Labs are mouth brooders. The female cares for 10 – 25 eggs in her mouth. She also keeps the fry in her mouth for up to 3 weeks. The female should be isolated after breeding. The fry can be fed brine shrimp.